As animation superfans, we didn’t quite know what we were getting ourselves into when we started the Rotoscopers. We thought it would just be a fun podcast featuring a bunch of nerdy friends talking about animation. Little did we know the show would blossom into a full-blown animation news site and resource. While the show is a source of endless fun for Morgan, Chelsea and Mason, there are numerous costs associated with production. Web and podcast hosting, website maintenance, and equipment are some of the little things that really add up! Plus, spending hours producing and editing the shows take away from our school and “real” jobs that pay the bills! 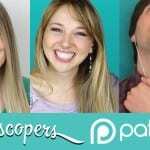 Patreon is a way for fans of the website, podcast and YouTube channel to support us with a small recurring monthly donation. We have different tiers set up with different perks and bonuses, including access to our secret patron-only Facebook group! To check out the perks of becoming a Rotoscopers patron, head on over to rotoscopers.com/patreon or click the Patreon image below! If you like listening to podcasts, you’ll love listening to audiobooks. It’s a great way to pass the time (as you wait for the next episode of The Animation Addicts podcast to be released) in your car on your way to work, at the gym, as you walk the dog, anytime! Audible is the world’s leading provider of audiobooks with over 100,000 downloadable titles. The Rotoscopers are offering you a free audiobook of your choice with a no-strings-attached, 30-day trial of Audible.com. Just go to rotoscopers.com/audible to claim your free audiobook! It’s a win-win situation: you get a free book and you’re also helping to support the Rotoscopers! 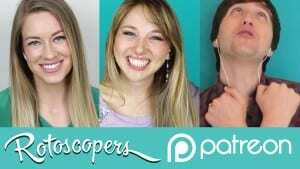 You can also help support the Rotoscopers and the Animation Addicts Podcast by donating via Paypal. If you live outside of the United States and can’t use our Amazon.com links, this is a great alternative. There’s no minimum requirement on how much to donate: $1, $5, $10, $?? ?—whatever works best for you! Your support helps us keep the podcast going and going and going! Donate here or using the button below.